While sparing the gentle reader and my typing fingers a lengthy discourse on the subject, for which, for those interested, I recommend the excellent wikipedia article on the subject, I think the genre can be characterized, if not defined by the following criteria, not all of which are necessarily present in a given film. You can't call these rules, since the exceptions outnumber the examples. They must be considered typical characteristics. A dark, gloomy world view tinged with mistrust, cynicism, and a sense of the absurd. Deliberate dramatic use of light and shadow. Moral ambivalence of the major characters, who tend to come to a bad end. Low or modestly budgeted - B movies either literally or in spirit. 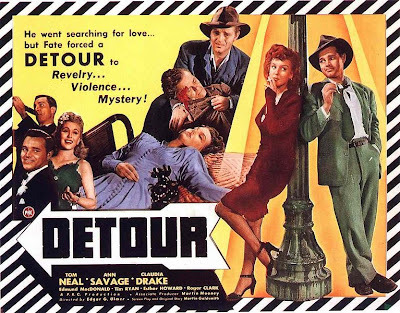 An excellent example of mid-40s noir is Detour (1945), which cost $117,000 to make when the average budget for a Hollywood feature was around $600,000. Even at that modest cost, it came in 30% over budget. 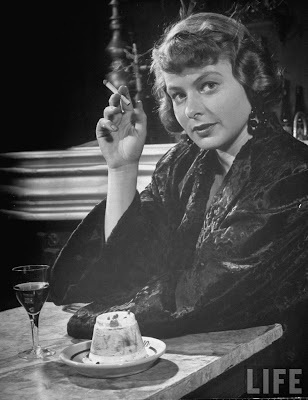 The image above is the immortal Ingrid in the 1948 Film Arch of Triumph. I have personally wasted, err, I mean invested many hours surfing the thousands of images available. Lotsa fun! My goal in starting this blog is to share my love of vintage movie star photos. I have been collecting these photos, especially photos of Gloria Grahame, for many years. As I have time, I hope to start a Gloria Grahame photo archive, sharing the hundreds of Gloria photos I have collected over the years. Here's a quick one to get started.